Here is another thing I love about the curriculum that we’re using — no shortcuts. Even the student’s way of writing, for instance, should be done the right way from the very beginning. 1. Sit back on your chair. Lean your body slightly forward and keep your head up. Be sure the lower part of your back touches the back of the chair. 2. Do not let the front of your body touch the front of the desk. 3. Keep your feet flat on the floor and slightly apart, so that they will hold the weight of your legs. 4. Your eyes should be about 12 inches from the paper on which you are writing. 5. Place your arms lightly on your office desk with your elbows slightly off the edge. 6. Rest your writing hand lightly on the outer edges of your third and fourth fingers. 7. Hold the pencil between your thumb, the tip of your first finger and the side of yoru second finger. Your first finger should be on the top of your pencil about an inch from its point. Your second finger should touch the pencil near its base. 8. If you are right-handed, point the top of the pencil toward your right shoulder. If youa re left-handed, point the top of the pencil toward your left shoulder. 9. Hold the top of the paper and push it along with the hand you do not use for writing. 10. If you are right-handed, place the paper in front of you so that the lower left corner points at the center points at the center of your body. Tilt the paper ot the left so your right arm is crossways to the lines on which you are writing. If you are left-handed, place the paper in front of you so that the lower right corner points at the center of your body. Tilt the paper to the right so that your left arm is crossways to the lines on which you are writing. 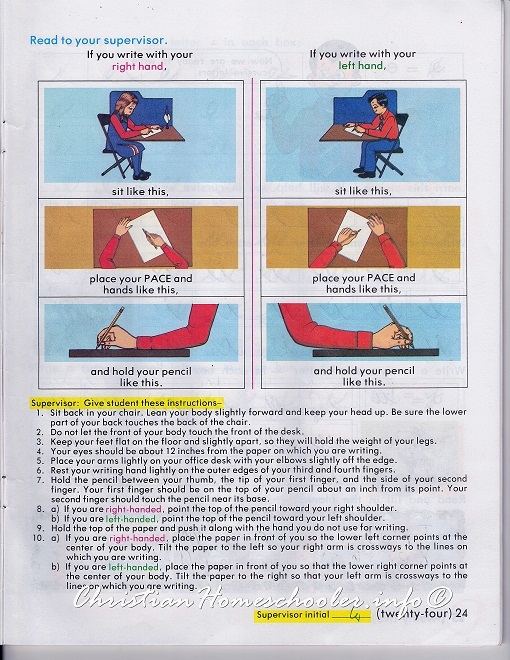 Given these instructions, when followed to the letter, will allow the student to be efficient in doing his school work. Instructions are given for a purpose, which are mostly practical. Whether instructions are for those that are as basic as the proper posture in writing or the ones given by medical practitioners from alcohol rehab treatment centers. Being effective means we have to do things a certain manner. The value of rules and instructions should be imparted to children as early as possible.